Tracy Hamm submitted this photo and caption. These photos are of my son Nathan and his two friends, Brittany and Matt. 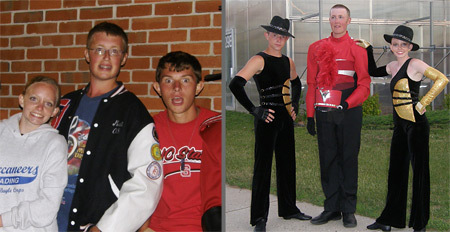 The first photo shows the three of them as high school seniors following a band competition. The second shot is of them after the Stillwater, Minn. competition as members of the Colts. The three of them have marched together for four years of high school band and then auditioned in December of 2007 for the Colts. Nathan and Brittany are members of the color guard and Matt plays trumpet. I took the photo while following the Colts during the first week of the season.